The annual Grand Summer Kickoff is growing and being taken over by our Westfield Welcome team! This event will be at Grand Park on Friday, May 24th (the last day of school for Westfield) and will take place 3:30pm - 8:30pm. We will have a Dodgeball Competition, vendors, kite-flying, a health fair, and our first-ever Family Adventure Course that stretches over 1.3 miles of Grand Park's 400-acre campus! 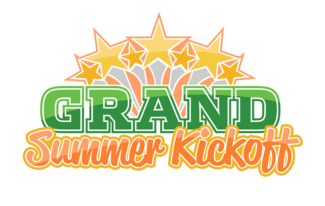 This event is FREE to the public, with the exception of registration for the Dodgeball Competition and Family Adventure Course.Proceeds from the Grand Summer Kickoff will benefit the Westfield Education Foundation. Activity monitors will be stationed at each activity stop along the Family Adventure Course to ensure that each team completes the activity according to the rules & instructions. Inflatable assistants will be assigned to the KidZone Inflatable Station and will monitor the use of the inflatable games as well as the safety of all participants. Directional guides will be positioned in key areas on the course to ensure that all participants are following the correct route. Hand out kites to participants and assist them with flying. Greet event participants, direct them to various activities, and float to help out where needed. Drive event participants get to various activities where needed. Ensure games stay within 5 minute limit using a stopwatch. In the event of overtime, ensure games stay within 2-minute time limit. Update game scores within "Best of 3 Games" Match. At the conclusion of each match, update the tournament bracket with results. Ensure teams are aware of their standings and when they will be playing. Become familiar with established GSK Dodgeball Rules and ensure participants follow the Rules of Play. Work in conjunction with Timing Assistants to ensure games stay within established time limits.